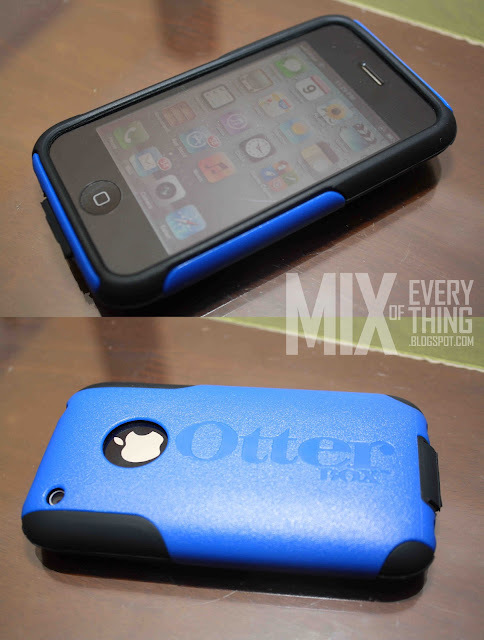 My Otterbox Commuter cases. Go for original or fake ones? - Hello! Welcome to my blog! My Otterbox Commuter cases. Go for original or fake ones? So I recently bought a couple of case for my uhhhhh old old phones somewhere. So I checked out a few nice covers and came across this Otter Box and it looked quite ok for my taste. So i went for it. For my 'Scarlet' Blackberry 9300 I got the Otter Curve Commuter Series. Looks and feel right. It is sleek with added protection to my device. It is sturdy, has this 2 sturdy layers, the silicon and smooth plastic on the outer layer. The buttons are embossed making sure that you have access to the Blackberry functions. The case has some rubber flaps that covers up the 3.5mm jack for your headset and for the charging outlet. It is kind of a bother but it does protect your device from dust. Do watch out and take care of the flaps when opening them up. My flap on the headset has a tear on it. (What do you expect from a fake one?). The hole on the silicone case of the charging outlet doesn't fit right, you would have to stretch it up a bit for it to be perfectly fit when plugging in the charger. Next up is my iPhone 3GS. Yes, I also got the Commuter series, but didn't have any luck in getting a better color. I wanted to have that black silicon but too bad there was none available. The case is simple and the color is a little striking. But its ok. It will somehow make my old phones look a little newer. Same as the Blackberry Commuter case, this one also has the flap type on the bottom for charging access. It is nice that they have these so that the device will be protected from dust and other substance when on the go. I was able to purchase the cases on the link bridge of the MRT and LRT. I purchased them in the evening. I also saw some at the city hall of Manila. From SM Manila to the underpass. You'd have lots to choose from. I gotta say that these cases that I got to score, well they're definitely worth it. With a little haggling, from P 160.00 each, I was able to get each for only P 140.00. I am guessing this will also cost around P 2,150. So it wasn't a bad deal actually, no one would really notice if it is original or not. Yes, I can buy the original ones but, I am not raelly fond of cases. One day I have a case, the next couple of days no more. So there, not really worth it. Then again, nothing beats having the original one. I do hope a couple of cases will be delivered at my doorstep any day now. :) It would be nice to be able to experience the original one and get a feel to compare it. "So, would you go for original or not?" nge malay ko ba... wala naman ako nilibre iba ah. :D he he he hanap kita ng pink? or yellow? Esquire Magazine's next cover is? Last day of the Half-Price Frappuccino®!!! The Dark Knight Banners. Snow series is out! Psyched about my cool QR code! BLUSH releases third single "All Stars"
Phillip Phillips wins American Idol!!! The Uniqlo Cast is revealed! Meet the Uniqlo Philippines' cast members! Uniqlo Philippines to unveil its cast. This is how I BonChon!!! A perfect treat for your mom this Mother's Day. SKY partners with ESPN HD to launch 1st SKY Zone. My Nike Warehouse Sale experience. Me and my Starbucks key chain. It's in the Bag at TOPS! Vengeful "HOT" Witch in "Dark Shadows"